Boeing has decided to take the wraps off their long rumored Blended Wing Body airframe design, and has released a detailed press release today about progress of this project. 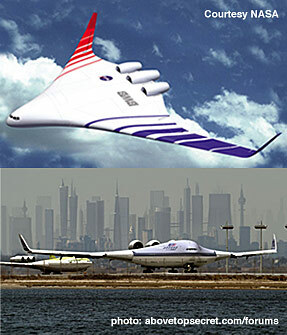 In doing my research on this post, I came across two images of the proposed BWB aircraft, shown above. Top is an artist’s concept from NASA, and the bottom is an interesting image that was posted in abovetopsecret.com’s forum. I’m not too sure about the bottom pic, it appears to be a damn fine Photoshop "mockup", since the BWB design has not yet been taken full-scale…or has it? HAMPTON, Va., May 04, 2006 -- In cooperation with NASA and the U.S. Air Force Research Laboratory, the Phantom Works organization of Boeing [NYSE: BA] is taking another step toward exploring and validating the structural, aerodynamic and operational advantages of a futuristic aircraft design called the blended wing body, or BWB. Two high-fidelity, 21-foot wingspan prototypes of the BWB concept have been designed and produced for wind tunnel and flight testing this year. The Air Force has designated the vehicles as the "X-48B," based on its interest in the design's potential as a flexible, long-range, high-capacity military aircraft. X-48B Ship No. 1 began wind tunnel testing on April 7 at the Langley Full-Scale Tunnel at NASA's Langley Research Center. When testing is completed in early May, it will be shipped to NASA's Dryden Flight Research Center in California to serve as a backup to Ship No. 2, which will be used for flight testing later this year. According to the team, both phases of testing are focused on learning more about the low-speed flight-control characteristics of the BWB concept. "The X-48B prototypes have been dynamically scaled to represent a much larger aircraft and are being used to demonstrate that a BWB is as controllable and safe during takeoff, approach and landing as a conventional military transport airplane," said Norm Princen, Boeing Phantom Works chief engineer for the X-48B program. The X-48B cooperative agreement by Boeing, NASA and the Air Force Research Laboratory (AFRL) culminates years of BWB research by NASA and Boeing. AFRL is interested in the concept for its potential future military applications. "We believe the BWB concept has the potential to cost effectively fill many roles required by the Air Force, such as tanking, weapons carriage, and command and control," said Capt. 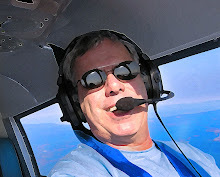 Scott Bjorge, AFRL X-48B program manager. "This research is a great cooperative effort, and a major step in the development of the BWB. AFRL is inspired to be involved in this critical test program." NASA also is committed to advancing the BWB concept. NASA and its partners have tested six different blended wing body models of various sizes over the last decade in four wind tunnels at the Langley Research Center. "One big difference between this airplane and the traditional tube and wing aircraft is that -- instead of a conventional tail -- the blended wing body relies solely on multiple control surfaces on the wing for stability and control," said Dan Vicroy, NASA senior research engineer at the Langley Research Center. "What we want to do with this wind-tunnel test is to look at how these surfaces can be best used to maneuver the aircraft." The two X-48B prototypes were built for Boeing Phantom Works by Cranfield Aerospace Ltd., in the United Kingdom in accordance with Boeing requirements and specifications. Made primarily of advanced lightweight composite materials, the prototypes weigh about 400 pounds each. Powered by three turbojet engines, they will be capable of flying up to 120 knots and 10,000 feet in altitude during flight testing. Boeing also contracted with Cranfield Aerospace to provide the ground-control station, in which a pilot will remotely control the X-48B during flight research testing. As part of Boeing's long-range business strategy, its Phantom Works advanced research and development organization defines and develops innovative technologies and systems such as the blended wing body concept to meet future aerospace needs. There is also some more to be found on the NASA site, found here.